Technology has made it possible for us to design, create, and maintain structures that were not feasible in years gone by. With the additional support of artificial intelligence, architects can make informed choices regarding the building’s structure. Variables such as materials, use, and climate can all be factored in quickly by modern technology. Together with Oasys, who offer retaining wall solutions, we take a look at some of the best examples of advanced architecture in the world. One of the most well-known companies in the world, tech titan Apple has moved to its new offices lately. Worth a staggering $234.7bn, the company, which is now one of the biggest on the planet, was able to invest a further $5bn into a new building and move its tremendous workforce into a circular futuristic structure. The new office-space, which opened in April 2017 midway through construction, is made up of 175 acres — and is even bigger than The Pentagon. This building’s unique trait comes from its roof. The whole structure’s roof is made from solar panels, which makes it one of the most efficient buildings the world has ever seen, in terms of energy saving. The solar panels are capable of generating 17 megawatts of power (75% during peak daytime) and the company has aims to make the complex entirely powered by renewable energy in the future. Another four megawatts are powered through the use of biofuel and natural gas within the complex, using Bloom Energy Servers which are popular within the Californian region, with Google, Yahoo and Wal-Mart using them, too. The building’s design also prioritised the use of natural heating, ventilation, and air control (HVAC).To achieve this, air is allowed to flow freely between the inside and outside of the building, which can help assist for nine months of the entire year — highlighting the importance of such features in the DNA of design. At 2,722 ft, the Burj Khalifa (also known as the Burj Dubai) is a sight to behold as the tallest structure in the world. Starting construction in 2004 and finalising the project in 2008, many decisions had to be made to ensure that this neo-futurism structure was able to serve its purpose, acknowledging that it would be a free-standing building and understanding the hot climate it would be situated in. A series of underground water networks delivers fresh water, which has been processed be desalination plants from sea water, to the whole city of Dubai, the skyscrapers included. When the water hits the Burj, it is distributed to every corner of every floor on every level. However, with 163 floors, this can become a complicated process, which shows us just how special the Burj Khalifa actually is in terms of design. The group of architects who planned the structure realised that using one pump for the skyscraper’s water supply could prove dangerous, due to the need for high pressure to send the water higher up. This pressure could lead to the pipes exploding. To counter this problem, they came up with a plan to help the water flow up the building in different stages. The water supply starts in the basement, then flows up to a 40th floor reservoir station. This station then pushes the water on to a series of 200,000-gallon tanks all the way to the top of the building. As the water reaches the top, the water then travels back down under its own weight — it is said that 946,000 litres of water are supplied per day which also helps the building stay cool in the hot climate. As a desert city, keeping buildings cool in Dubai is vital. Therefore, another water supply — an ice-chilled water system which is the first of its kind to be used in the Middle East — has also been implemented to enable substantial energy savings. The previous title-holder for the tallest building in the world, the Taipei 101 is a platinum certified Leadership in Energy and Environmental Design (LEED) build. Up until 2016, the structure had the fastest elevator on the planet, which could travel from the 5th to 89th floor in 37 seconds! Taiwan has a multitude of different structures to its name, from the traditional Fort Provintia, to the super-modern Tuntex Sky Tower. But what makes it so spectacular? Starting construction in 1999 and ending in 2004, the Taipei has 101 floors (if the name had not given it away) and is 1,666 ft in height — but the environmental factors that took over its design has changed the way we build for good. Just as the Burj Khalifa’s architects had to consider the building’s need to be kept cool, the architects of the Taipei 101 had to consider Taiwan’s affinity for natural disasters, such as earthquakes and typhoons. When it comes to Taipei 101, the structure can withstand high winds of 134 mph, which is due to the model prioritising resistance through the use of curtain walls, protected glass and high-performance steel. The walls can provide heat and ultraviolet protection by blocking external heat by 50%. The Taipei 101 has a structure that includes 36 steel columns. Eight of these are known as mega columns, and they have 10,000 pounds of concrete per inch. Within Taipei 101, there are outrigger trusses every eight floors which connect to the columns within the exterior to ensure secure resistance from probable natural disasters in and around Taiwan. Technology will only continue to grow, so we are set to see even more projects come to fruition that balance a design aesthetic with vital survival features. For example, London is set to have 13 new skyscrapers by 2026 — we know that these will be designed to uphold the ethical requirements for a modern-day structure. Architecture practice Maber has reorganised its top management to drive growth in London and the Midlands. Managing Director Mark Hobson becomes CEO and will focus on the practice’s growing London office and portfolio of projects in the capital. Ian Harris, previously head of Maber’s Leicester office takes over as Managing Director with a brief to develop the practice’s Nottingham, Derby, Leicester and Birmingham offices. Tim Boxford, an Associate Director who has developed several high-profile projects in the East Midlands, has stepped up to lead the Leicester office. Catherine Lambert has been promoted to become an Associate. Through longstanding client relationships, Maber has generated a healthy crop of projects in London with a construction value around £400 million and including large scale mixed use developments, build to rent schemes, hotels and student accommodation as well as work in the education sector. Artificial intelligence is improving the way we design and build, creating endless opportunities for us to discover. Artificial intelligence is where machines exhibit their own intelligence through using algorithms to solve problems using inputted data. By harnessing robotics, construction managers can utilise intelligent machines that can perform routine tasks that were once completed by humans, such as bricklaying. Alternatively, AI systems can collate and organise information for engineers to use within project planning and design implementation. Together with Oasys, we assess the way the construction industry is starting to use AI in order to complete projects that contain fewer errors, less omissions, safer working practices, improved workflows and more on-time worksite completions. From the first stages of construction, AI is there to support the planning. Autonomous equipment is considered as AI as it is aware of its surroundings and is capable of navigation without human input. In the planning stages, AI machinery can survey a proposed construction site and gather enough information to create 3D maps, blueprints and construction plans. Without the help of artificial intelligence, this is a task that would usually take weeks, but now, it can be achieved within one day. This helps to save firms both time and money in the form of labour. Controlling the project is important and helps keep everything in the right place – AI is now being used to do this. For example, workers can input sick days, vacancies and sudden departures into a data system and it will adapt the project accordingly. The AI will understand that the task must be moved to another employee and will do so on its own accord. Databases that have an artificial intelligence focus are helping to direct engineers on how projects they are working on need to be done. For example, if engineers were working on a proposed new bridge, AI systems would be able to advise and present a case for how the bridge should be constructed. This is based on past projects over the last 50 years, as well as verifying pre-existing blueprints for the design and implementation stages of the project. By having this information to hand, engineers can make crucial decisions based on evidence that they may not have previously had at their disposal. When the construction industry builds tall structures, autonomous machinery is being developed to help drivers remain out of the vehicle whilst it’s working at substantial heights. Using sensors and GPS, the vehicle can calculate the safest route. Whether the structure was made for commercial reasons or for homes, AI can be implemented inside too. In the US alone, $1.5 billion was invested in 2016 by companies looking to capitalise on this growing market. Las Vegas hotel Wynn has said that by the end of this year they will have an Amazon Echo in every room within their hotel. These devices can be used for aspects of the room such as lighting, temperature and any audio-visual equipment contained in the room. These systems can also be used within domestic settings, allowing homeowners to control aspects of their home through voice commands and systems that control all electronic components from one device. Keeping information about structures and how they were built are important and a BIM (Building Information Modelling) can help you achieve this. It allows you to look back on management decisions and much more. A conversation can be started by virtual assistants, also known as VAs, as well as providing the information that you need. By combining VAs alongside NFC (near-field communication), VAs can be given additional information to the building itself in real-time from various sensors in the building. For example, if there were structural problems with a building, then VAs could inform engineers specifically where the problem was and how it can be fixed. The use of engineers, AIs and VAs can help save the construction industry a lot of time when it comes to the expected amount of work. As the future of AI becomes more of a reality within construction, only time will tell how reliant upon intelligent machines we will have to be in order to construct innovative building designs. Which listed buildings could be yours? There are many beautiful listed buildings across the UK. There are a few on the market that could become yours if you can offer the right asking price! Main features: Fancy hosting a party for all of the extended family? You’ll never be short of sleeping space in this property. Boasting nine bedrooms and 14 acres of land — there’s enough space for everyone! Also find a stone-style wine vault, a palm house orangery and a cupola dome that will remind you of Rome’s Basilisca as part of the property. Walking inside The Castle, you’ll find more luxurious furnishings. Features include a sweeping staircase, a formal drawing room, a games room and two storeys of fully-furnished bedrooms complete with bathrooms. When was it constructed? Information not available. What are the notable features? You could be the envy of all Harry Potter fans as this property was part of the set of Harry Potter and The Deathly Hallows. The exterior is designed to impress with exposed timbers, herringbone design, leaded mullions and ornate carved timbers. Inside is not short of luxury either — a stone spiral staircase which comes complete with a carved brick handrail, a huge timber frame, traditional fireplaces and both Medieval and Tudor wall paintings could all be yours. When was it constructed? Built in the 18th century, though remodelled in the mid-19th century. What are the notable features? This property has been around for a lot of history — it was once used as either a coach or a cart house. Today however, the property is host to a granary on the first floor with open shelter below, an oak framed orangery and conservatory, integrated double garages and approximately 0.25 acres of private garden space. What are the notable features? There are exposed timbers and oak doors which are all inspired by the Tudor era. There are plenty of additions that come with this property too — secondary accommodation, a heated swimming pool, tennis courts and a vegetable garden. When was it constructed? While an Estate called Dalmoak has been around since the Middle Ages and a structure was in place of today’s building from the 15th century, Dalmoak Castle wasn’t built until between 1866 and 1868 by architect Alexander Watt. What are the notable features? The castle is recognised by many as a castellated mansion house which comes complete with a tall tower. Once you enter the property you are met with a central hall with an imperial set of stairs, the property’s interior also features a drawing room featuring ceiling plasterwork and scagliola columns and a collection of stained glass windows. What are the notable features? Living at The Mill House, you’ll always be entertained thanks to the Georgian-fronted property’s four bedrooms and collection of outbuildings. Another attraction is its location — set across from the River Tas. When was it constructed? Built in the 17th century, though extended and restored in 1891. What are the notable features? Famous as one of the first great houses of Staffordshire, this property is not one to be missed. Key features include a 19th century Jacobean style timber fireplace surround that is heavily carved in relief, a parlour designed with floor to ceiling oak panelling and a stair window designed with stained glass and etched with the motto “WHERE ‘ERE / WE ROAM / AN ENGLISH MOTHER / IN AN ENGLISH HOME”. When was it constructed? The 16th century. What are the notable features? The size is an impressive feature of this house. The 16th century manor house is host to four bedrooms and over an acre of gardens too. When was it constructed? Estimated to have been built circa 1500s, though extended and modernized in 1937. What are the notable features? A remarkable staircase is one memorable feature of this property. It was once described as a “remarkable staircase of heart and oak” by Richard Polwhele when covering his History of Devonshire. The property is built from local flintstone and includes impressive features such as an old bread oven and a beamed dining room. Gardens surround the chantry where a thatched summerhouse sits and huge glasshouse. There is also a small stream that borders the property. When was it constructed? Originally built circa 1300, though partly demolished to make way for a house in the 16th century which then became ruinous, and was thus adapted into a reduce house during the early part of the 19th century. What are the notable features? The location is one impressive feature of this property as it sits across from the River Wye. Recently the subject of an impressive restoration programme, the Castle features architecture from a range of eras including the Norman, Tudor, Elizabethan, Georgian and Victorian eras alike. It is also home to the spectacular Great Tower, Medieval castle walls and the ruins of a Tudor manor house. Applying grout to steel columns and the like sounds simple in theory, but in practise it is quite a specialist process. As with most things in life, lack of proper preparation will lead to poor results. Filling the gap that exists between a steel plate and substrate when used to secure columns and machinery requires a grout that is easily poured and flows evenly around the void. This is best achieved by installing wooden formwork around the base plate and pouring into a header box/hopper for continuous flow to ensure an even application and prevent any air entrapment. With cementitious grout, its long-term success is largely decided at the mixing stage – too much water will affect its overall strength; too little will affect its flowable capabilities. As an alternative void-filler for base plates and such, it’s not uncommon for builders to use hand-applied repair mortar. But this is far from ideal as an even application is almost impossible to achieve, thus air bubbles and gaps are a likely result. Any product containing cement will ultimately shrink and create gaps; therefore a shrinkage compensated grout is essential. If applying a grout to a concrete substrate it’s essential to pre-soak the substrate in clean water for a minimum of two hours beforehand. Failure to do so is likely to result in the concrete extracting from the grout, affecting its cure, leaving a potential for cracking and reduced adhesion. The SikaGrout® range contains high-quality, flowable, cementitious grouts for general purpose or large commercial applications. SikaGrout® 111GP, for instance, meets the requirements of Class R4 of BS EN 1504-6. Pumped or poured, it’s ideal for a number of solutions including machine and base plate-filling, concrete repairs and steel reinforcement anchoring. Specifying the correct quantity and strength of grout is a basic requirement for a quality application, but it’s a simple trick that can sometimes be missed. Specifying the correct quantity and strength of grout is a basic requirement for a quality application, but it’s a simple trick that can sometimes be missed. Sika’s technical team is available to eliminate the risk of such oversights. Our staff have the necessary expertise and product information to ensure correct grout quantity and type for a particular project and are also available for site visits to offer application guidance. Cementitious grout – once it’s fully cured – can achieve compressive strengths greater than standard C40 concrete. Attempting to remove it from beneath a steel base plate due to specification or application error could result in a very long and costly process. Better, then, to ensure this simple but extremely important task is carried out correctly – which means paying close attention to the product data sheet before the grout-pouring begins. In these instances, there is no such thing as being over-prepared. As engineering firms move toward developing a digital strategy, a new phrase – going digital- will resonate with engineering, architectural, and construction professionals, as well as infrastructure asset owners, is now part of the infrastructure lexicon. Going digital refers to the business transformation being realized as infrastructure professionals take advantage of a connected data environment by leveraging a cloud computing platform that digitally connects and converges people, processes, data, and technology to yield significant benefits. In its broadest sense, going digital means moving data that used to be locked in application-specific files or even paper documents, and making the data inherent in these files and documents available to be consumed and analyzed by other software and processes. Through going digital, 3D digital engineering models created during the planning and design phase can provide the interactive 3D environment for operations and infrastructure asset performance modeling, leveraging cloud computing, predictive analytics, and operational data from the Industrial Internet of Things and other sources. These models can now be referenced throughout the full lifecycle of an infrastructure asset, improving performance, safety, and sustainability. But what about an infrastructure asset that does not have a digital engineering model? Reality modeling, an exciting technology that involves the process of capturing existing facilities and site conditions with the use of digital photographs and/or point-cloud data – enables the rapid creation of 3D, engineering-ready mesh representations of the existing, as-operated conditions. The process is simple: overlapping photographs taken with a camera either handheld or mounted on a UAV are uploaded to a cloud processing service that automatically reconstructs the 3D model for use in engineering applications. Further detail and accuracy can be added to the model through close range photos or point-cloud data from laser scanners. 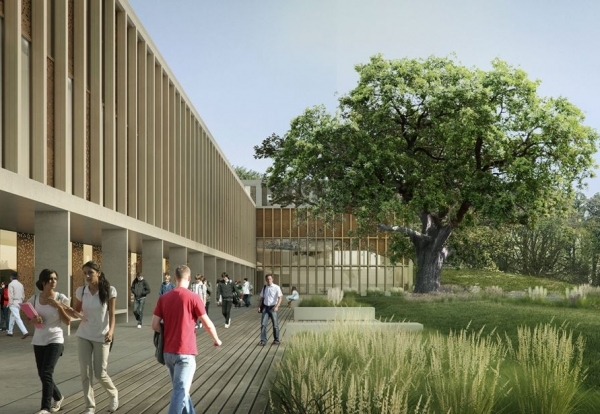 Lancaster University has been granted planning permission for an 85,000 sq ft health innovation building. Planning permission was already in place for a development of land immediately adjacent to the university’s Bailrigg Campus, but approval has now been given for the £41m first phase of the facility. The Health Innovation Campus aims to bring together innovators, academics, businesses and health care providers to drive advances in health treatment. Designed by John McAslan & Partners, the building will stretch over 120m rising from two to 5 storeys. The plan is to clad the scheme in a mix of natural stone aggregates to form robust lightweight concrete panels and bronze toned anodised aluminium mullions and panels. Construction work is due to begin this year with completion in September 2019. If you have been thinking of getting your listed property spruced up, whether it’s an extension or re-structuring the foundations, there are fundamental things that you will need to consider before. Sarah Khan, a member of the Society for the Protection of Ancient Buildings (SPAB) and Jonathan Clark who is a member of the RIBA conservation group share their top tips on approaching a listed building restoration. According to RIBA accredited Conservation Architect Sarah Khan if you plan on doing work to both the interior and exterior of the building, you’ll need to apply for listed building consent and planning permission. If your listed building is in a conservation area, you’ll need to take this into account. Late last year it was announced that the Buckingham Palace will undergo a 10 year refit. Work will start in April 2017 and will focus on replacing 33-year-old boilers, electrical cables and pipework. The most common misconception people have is that just the façade of a property is listed says Sarah, find out everything you need to know about your property from your local council. The restoration projects of the Elizabeth Tower (Big Ben) includes using original gold paint for the face of the clock, prepare yourself for the fact that the use of cheap, modern materials will often not be possible, advises Sarah. The biggest challenge we faced was undoubtedly dealing with the conservation officer. It was a process of negotiation and convincing them that our proposals would materially enhance the building and bring it into the 21st century in a sympathetic way – says Jonathan Clarke, founder of Jonathan Clark Architects. Sarah and John share their experiences working with listed building restorations as part of the Hiscox cover stories campaign, read their full interview here.